Hiroyuki Yoshida is an Assistant Professor in the Functional Molecular Materials and Devices Lab in the Division of Electrical, Electronic, and Information Engineering of Osaka University, Japan. He obtained his M. Sc. (2006) and Ph. D. (2009) degrees from Osaka University, under the guidance of Prof. Masanori Ozaki. He is a recipient of the 2010 Glenn H. Brown prize for his Ph. D. thesis, "Artificial modulation of self-organized structures in liquid crystals and its application to photonic devices". He has worked on a number of different topics in liquid crystals, such as tunable photonic crystals, plasmonics, lasers, and patterned alignment. His research includes proposing new device structures as well as controlling the self-organization behavior of liquid crystals on the microscale to bring out new functions. He has been working on blue phases since 2008 and is intrigued by the beautiful textures exhibited by this mysterious phase. He is interested in understanding how the structure of the blue phase lattice is related to its optical and electrical properties. 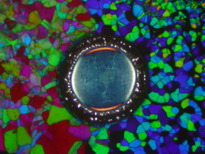 The photo shows cholesteric blue phases I (left) and II (right) exhibited by a photopolymerizable chiral liquid crystal. The region in the middle is where photopolymerization has been selectively induced by a weak UV light source; because the UV light intensity is below threshold, the blue phase texture is not preserved and a yellowish texture similar to that observed when the sample is polymerized in the isotropic phase appears. Interestingly, upon changing the intensity of the UV light, one finds that the threshold intensity required to polymerize blue phase I is higher than that required to stabilize blue phase II. This may be a consequence of the two phases having different crystallographic structures and distribution of disclination lines. Photo taken on a Polarizing Optical Microscope (Nikon, Eclispse E-600 POL) in transmission mode, equipped with a Mettler heating stage (FP-82HT) and Digital Camera (Nikon E4500). Width of image, about 500 microns. Reference: H. Yoshida et al., Chem. Lett., 37, 1242 (2008). Jury comment: The author gives an interesting story on polymerization of blue phases.